Illinois Judge Allows 11-Year-Old Girl To Use Medical Marijuana At School : The Two-Way Medical marijuana is legal in 29 states, but only a handful have allowed students to use their legal prescriptions in school. 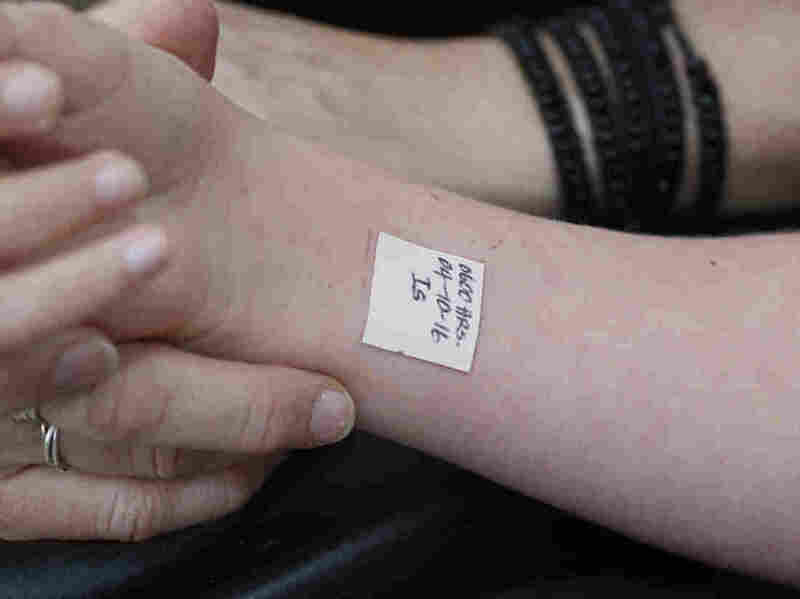 A medical marijuana patch on a patient's arm. Medical marijuana is legal in Illinois, but an 11-year-old girl who uses it to combat seizures had to get court approval to use it in school. Medical marijuana is legal in Illinois, and it is against current law for students to use it in school or have school nurses administer it. Now, Ashley Surin is the sole exemption. She overcame a leukemia diagnosis at 2 years old with extensive chemotherapy, but some of her treatments eventually led to having semi regular seizures. Her mother, Maureen Surin, told NPR that since starting medical marijuana treatment, her seizures have immensely declined in number. "We're amazed with her progress," Surin said. Her parents filed a lawsuit in federal court on Wednesday against Schaumburg School District 54 and the State of Illinois, claiming that the state's ban on taking the drug at school violates the Individuals With Disabilities Education Act (IDEA). On Friday, a judge ruled in their favor after hearing from the school district, which reportedly had concerns that its employees may be subject to legal penalties for helping Ashley with her medications. "What people seem to misunderstand here is that medical marijuana is a prescription like any other drug," Glink said. "Prohibiting it in school would be the same as prohibiting other medications such as Ritalin, Adderall or Concerta." Lawyers for the school district and attorney general's office will meet back in court next week to work on a long-term plan for Ashley and the school. Ashley uses a patch on her foot and an oil extract on her wrists. "No one's saying she wants to fire up a bong in math class," the judge said, reported the Chicago Tribune. Medical marijuana is legal in 29 states, but only three — New Jersey, Maine, and Colorado — say schools must allow students to use their legal prescriptions in school. In Washington State, schools are not legally required to permit on-site medical marijuana use; instead, schools can decide themselves. "Ashley cannot wait to return to school," Glink told NPR. "Now, that will happen on Tuesday."